This post is a bit awkward as it is dedicated to women I have never met. Strangers. And yet they are a true inspiration to me every day. They give me something to strive for, to work towards. As mentioned before, I just recently, 4 years or so, got very seriously into crochet and some days it's all I can think of. I can't get home fast enough and get to work on my latest project. During the summer there is typically less time to crochet so I try not to plan too much but I have come up with a wonderful project for this summer to keep me busy both at home and at the cottage. About a year ago I learned of Marinke Slump, A Creative Being, and the first item I came across was a blog post by her sister, made after her passing. I was stricken by this and felt deeply saddened. Intrigued by this lovely young lady and her blog, her love of crochet and color, I ordered her book, BoHo Crochet, and eagerly read through it looking for her crochet ideas and patterns. As I read more about her I came across a tribute blanket which Marinke began before her passing and others finished afterwards. It was meant to be a CAL but she was unable to finish it before taking her own life after a battle with depression. It's a pattern made up of a variety of 7" blocks which are eventually joined to make a colorful and breathtaking blanket. 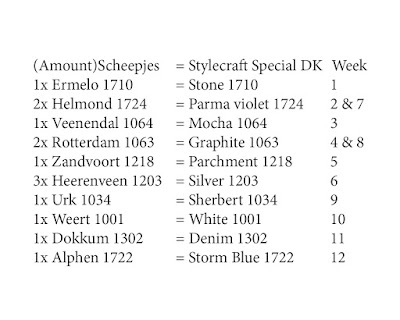 Each block is designed by a different designer, all with Marinke in mind. Dance in the Rain and Dance in the Sea are the same CAL blanket pattern but in different colors. There is a third color scheme for this blanket pattern, in jewel tones, but these are the two that made my heart sing and I couldn't possibly decide between the two. I pictured one on each of the beds at the cottage and imagined working on them simultaneously while at home and at the lake. What a great summer project and my Nod to a young lady who's life was cut too short, and to all the other designers who chose this was to pay tribute to her. 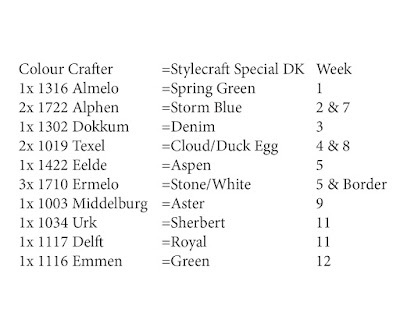 I choose to work with Styecraft special DK and had to do a little sleuthing to get the colors right. 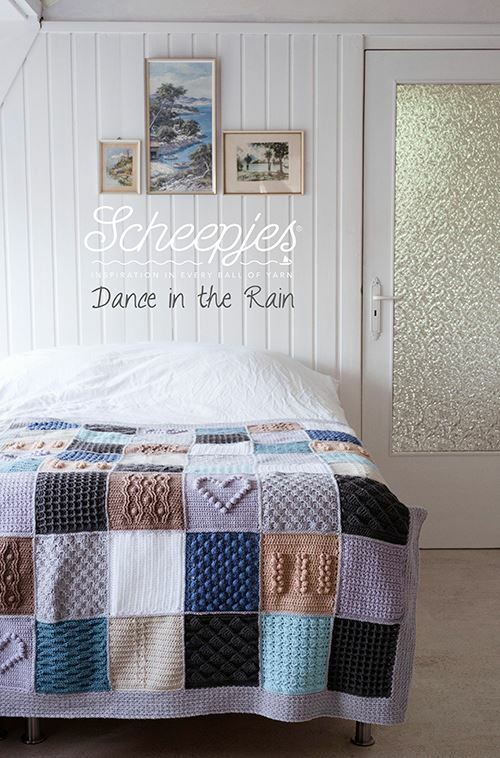 For Dance in the Rain it was easy as the color codes were suspiciously the same in Scheepjes and Stylecraft. I just had to work out which color to use for which week. 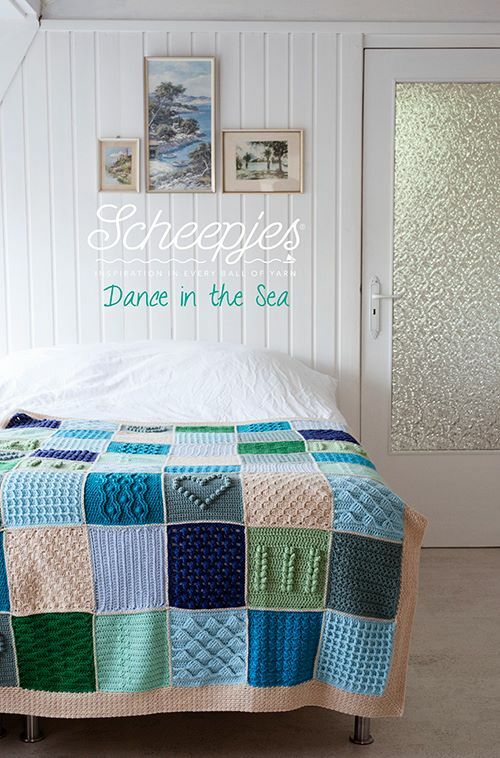 Dance in the Sea took the use of my color selector card for Stylecraft and a fair bit of time and decisions. So I ordered my yarn from Wool Warehouse and anxiously awaited it arrival. The ladies at work laughed at me when these two giant bags showed up two weeks later. "more yarn!" "another blanket?" "No, two," I say with a giant smile. Then I shared with them all the lovely colors and told them about Marinke and the tribute blankets I will be working on. I dove right in with my favourite color, Parma Violet, but as I was working on my squares I noticed them curling up on the corners. This is when I started to read up on Blocking. So back to Amazon.ca to order my Blocking Mats. Luckily I had the pins in my stash of craft supplies so I was off to the races. Blocking this little beauties made all the difference. You can nudge them into place and it is set for life. I have completed the four blocks for Week 7 for both blankets. Photos to come over the summer as I work on these two blankets. But I will show them in order and share with you any issues I encounter as I go along. I am shooting for one block pattern a week (8 blocks) but I am already behind while I waited for my blocking mats to arrive and to see if blocking actually works. I wonder if there is anyone else working on these lovely blankets at the same time. Have a wonderful week and have fun with all your projects and make sure to get out and enjoy this lovely spring weather. Hello and Welcome to my little bit of sanity. I hope you find something interesting and perhaps inspirational. I have been inspired by so many I want to share the projects I have worked on and things I have learned along the way.